Reviews "Fabao 101 B Hair Formula"
Topical solution for seborrheic dermatitis and the early seborrheic alopecia. 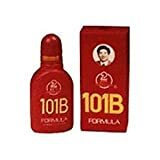 Fabao 101 B Hair Formula contains high levels of natural herbs which prevent the conversion of testosterone to DHT, and inhibit DHT’s binding to cellular receptor sites, increasing the breakdown and excretion of DHT. Once DHT levels decrease and the hair growth cycle is altered, the follicles can begin to produce normal levels of hair again. Fabao 101 B hair tonic is the most ideal external liniment for treating seborrheic dermatitis and the early seborrheic alopecia. It is very effective in stopping itchiness, eliminating dandruff, dispelling grease and preventing hair loss associated with seborrheic dermatitis.